The 2018 schedule will play out over 14 weeks, concluding on Sat., Dec. 1 with the Mountain West Football Championship Game featuring the two divisional champions. 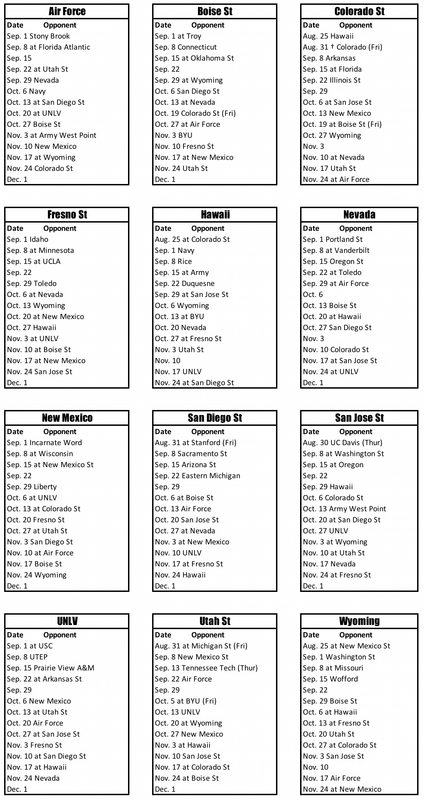 The nonconference slate features 25 games against teams that earned bowl berths in 2017, including Arizona State, Arkansas State, Army (three games), Florida Atlantic, Michigan State, Missouri, Navy (two games), New Mexico State (three games), Oklahoma State, Oregon, Stanford, Toledo (two games), Troy, UCLA, USC, Washington State (two games) and Wisconsin. Five nonconference opponents finished ranked in last year’s final Associated Press Top 25 and USA Today/Coaches’ polls, including #7/6 Wisconsin, #12/10 USC, #14/14 Oklahoma State, #15/16 Michigan State and #20/19 Stanford.